Homestead residents Frank and Barbara Cutko moved in to their new apartment in October 2018. Just in time for March Madness, we chatted with Mr. Cutko, who officiated college basketball for 35 years. During his career, Frank officiated many major college basketball games throughout the country, including Patrick Ewing’s first game at Georgetown and David Robinson’s first game at Navy. Both players are in the Naismith Memorial Basketball Hall of Fame. 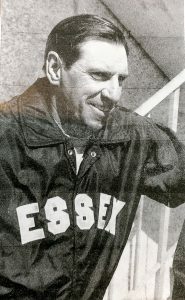 Frank was president of the National Basketball Referees Association for several years. Born and raised in Connecticut, Frank played basketball in high school and earned a scholarship to play basketball at Muhlenberg College. He also played for the Wilkes-Barre Barons in the Eastern Professional Basketball League from 1954-56. His officiating career also enabled him to attend the 1968 Olympics in Colorado Springs with the US Olympic basketball team. Frank worked for the YMCA for 12 years, six in Connecticut and then another six when he and his wife, Barbara moved to Baltimore. He also spent 35 years teaching and coaching baseball and fast pitch softball at the Community College of Baltimore County Essex campus. He also officiated college baseball. The Cutkos lived in the Govans section of Baltimore for 50 years prior to moving to Springwell Senior Living last year (first to the main building in August, and then to their apartment at The Homestead in October). The sports fans enjoy traveling, especially to out of town Orioles and Ravens games. They have two children, Andy and Valerie, and two grandchildren.